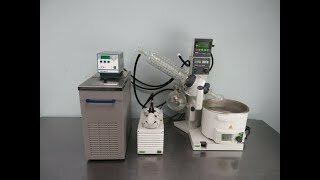 The Buchi R-205 Rotary Evaporator with chiller is an efficient way to evaporate and distill compounds and solvents in a compact footprint. This rotary evaporator is outfitted with an diagonal A glass assembly that's water chilled, and is capable of continous feed through a special inlet for large volumes. This rotavapor uses durable, chemical resistant PTFE glassware throughout the entire assembly, with quick release fittings. The Buchi R-205 Rotavap features a motorized servo jack that effortlessly lifts and lowers the glassware on the rotary evaporator with the touch of a button, and can handle flasks between 50 mL and 3L. The Buchi R 205 has a digital control and display that shows you not only the speed at which the rotavap is operating but also the temperature of the vapor, letting you monitor progress. This rotary evaporator is partnered with a B-491 heating bath , with a temperature range of between 20 to 180° C (68-356°F) that can be used with either oil or water. The R-205 is also partnered with a V-500 constructed of highly resistant material, with a maximum pressure of 10 mBar and a flow rate of 32 l/m, that’s controlled by a Buchi V-800 for precise, digital implementation. In addition, this rotavap comes equipped with a 6 liter VWR 1160S digital chiller, that heats and cools with a temperature range of between -20 to 150°C and is an excellent alternative to tap water cooling. This Buchi R-205 Rotary Evaporator and it's accesory components have been thoroughly inspected and all are performing to expectations. All of our lab equipment comes backed with our standard warranty. Should you have any questions, please don't hesitate to contact us.